Sitting in a stadium that seats 10,000, I look down at the ring and something I never thought I’d see in Asia: a bullfight. 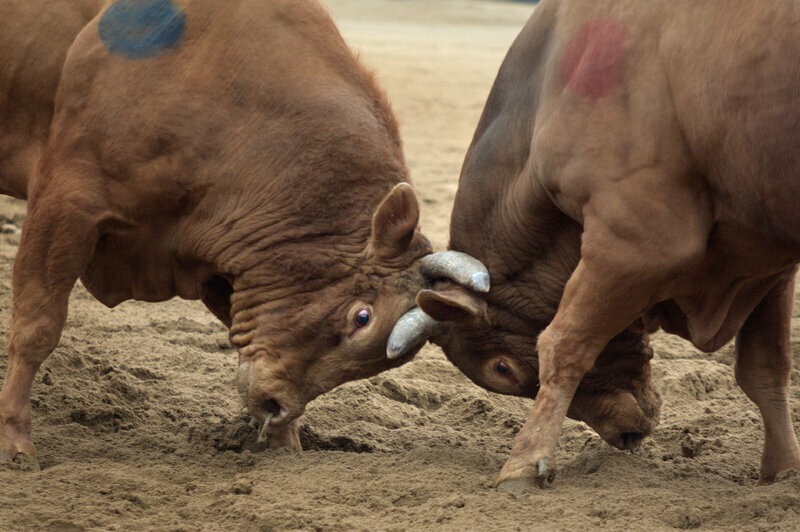 But instead of pitting matador versus beast, two bulls face off in the South Korean version. And befitting a Buddhist country, the battle ends not in death, but in surrender. In some cases, one of the combatants simply turns and wanders off. “In Korean bullfighting there is no mortal end in sight for these beasts of burden,” my interpreter says. The small town of Cheongdo, in the country’s south, hosts the annual Bullfighting Festival every spring at the stadium. 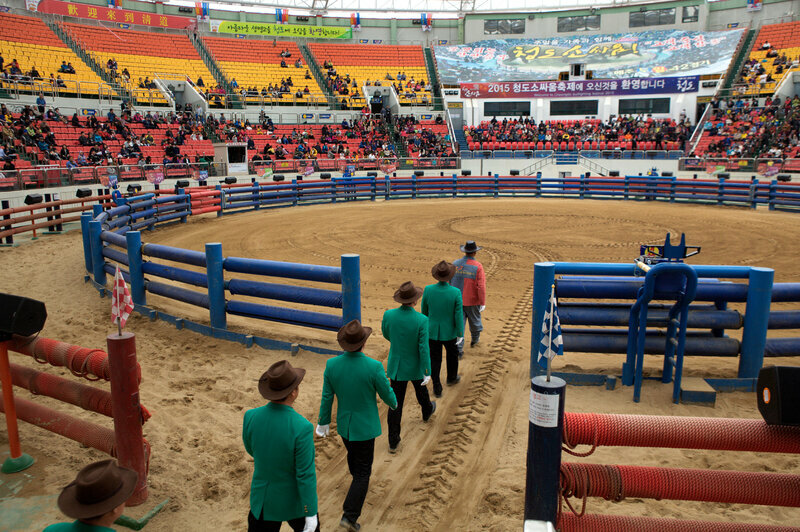 After a tractor rakes the dirt, the judges in green blazers, white gloves and cowboy hats enter the bovine battleground, bow to the audience and take their places. Then the competitors come trundling out of the tunnel: The General, a hulking brown bull with a red bulls-eye painted on its body, and his opponent, Dragon, identified by a blue bulls-eye and led by a handler in a puncture-proof vest. After snorting, moaning and scraping the dirt with their forefeet, two of South Korea’s fiercest bulls clash — racking horns and head butting. But there’s not a lot of gore, and certainly not death. “It is a thousand-year-old tradition passed down from our ancestors,” says Lee Kang-min, an avid fan who has attended every year but one since the stadium was built in 2002. 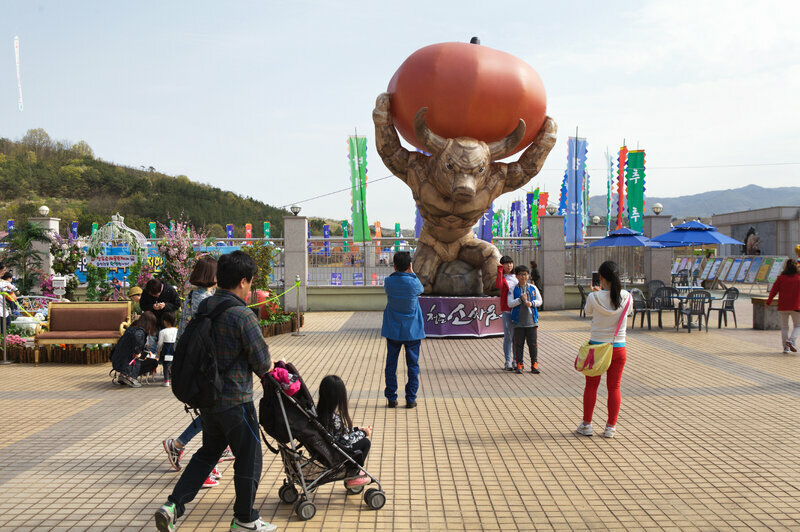 The only exception was last year, when the festival was canceled due to the ferry disaster that killed more than 300, many of them high school students. When young bulls are about a year old, around the time they’re fitted with nose rings, they are also assessed to see if they have what it takes to fight. Head size, horn shape and strength of the hind legs are all factors. The bulls selected are then put through intense training to beef up their size and strength: they haul tires with a rope tied to the neck, they run in the pastures, and rack their horns against tree trunks. Unlike other places, betting on these bullfights isn’t just permitted, it’s encouraged. 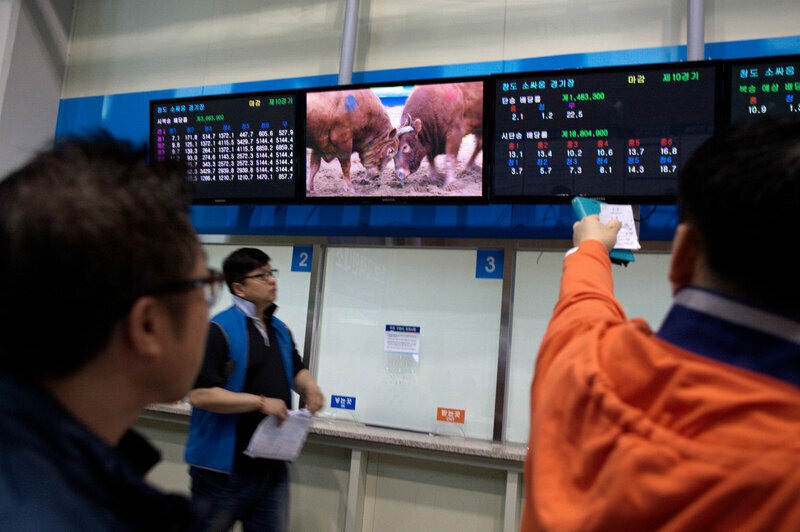 The maximum bet is capped at 100,000 won, or about $95. What he said rang true. When I attended, there were neither frenzied winners nor losers hanging their heads in dismay. At the end of the day, I place a 10,000 won bet on Wild Beast. He barely locks horns with his opponent when the rival bull breaks off and runs away. It is the shortest fight of the day, lasting less than 10 seconds. But it earns me a win and a bit of Zen, happily achieved without the sight of a matador, a red cape or lances dangling from the bloody nape of a bull. Previous Post Lee Jin-gu: Deep affection for his Bulls. Slept with his bulls for a week.